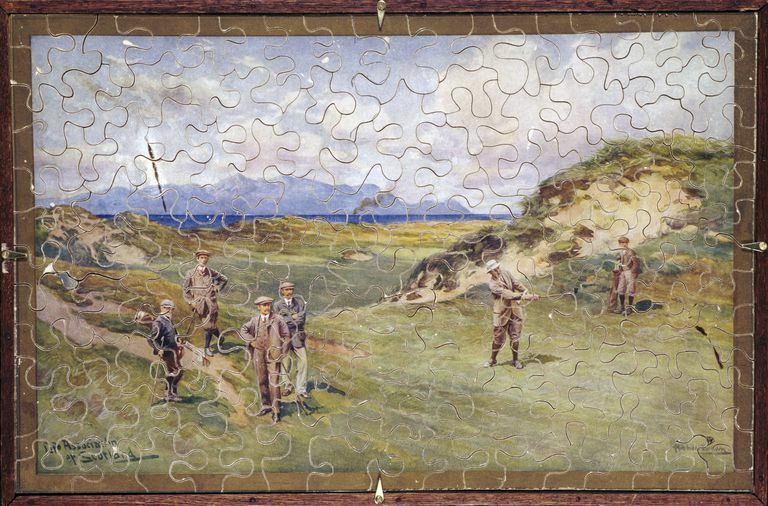 The jigsaw puzzle—that delightful and perplexing challenge wherein a picture made of cardboard or wood has been cut into differently shaped pieces that must be fit together—is widely thought of as an entertaining pastime. But it didn’t start out that way! Believe it or not, the birth of the jigsaw puzzle was rooted in education. Englishman John Spilsbury, a London engraver and mapmaker, invented the jigsaw puzzle in 1767. The first jigsaw puzzle was a map of the world. Spilsbury attached a map to a piece of wood and then cut out each country. Teachers used Spilsbury's puzzles to teach geography. Students learned their geography lessons by putting the world maps back together. With the invention of the first fret treadle saw in 1865, the ability to create machine-aided curved lines was at hand. This tool, which operated with foot pedals like a sewing machine, was perfect for the creation of puzzles. Eventually, the fret or scroll saw came to also be known as the jigsaw. By 1880, jigsaw puzzles were being machine crafted, and although cardboard puzzles entered the market, wood jigsaw puzzles remained the bigger seller. Mass production of jigsaw puzzles began in the 20th century with the advent of die-cut machines. In this process sharp, metal dies for each puzzle were created and, operating like print-making stencils, were pressed down on sheets of cardboard or soft woods to cut the sheet into pieces. This invention coincided with the golden age of jigsaws of the 1930s. Companies on both sides of the Atlantic churned out a variety of puzzles with pictures depicting everything from domestic scenes to railroad trains. In the 1930s puzzles were distributed as low-cost marketing tools in the U.S. Companies offered the puzzles for special low prices with the purchase of other items. For example, a newspaper ad from the period trumpets the offer of a $.25 jigsaw of the Maple Leaf hockey team and a $.10 theater ticket with the purchase of Dr. Gardner’s Toothpaste (normally $.39) for just $.49. The industry also created excitement by issuing “The Jig of the Week” for puzzle fans. The jigsaw puzzle remained a steady pastime—reusable and a great activity for groups or for an individual—for decades. With the invention of digital applications, the virtual jigsaw puzzle arrived in the 21st century and a number of apps were created allowing users to solve puzzles on their smartphones and tablets.